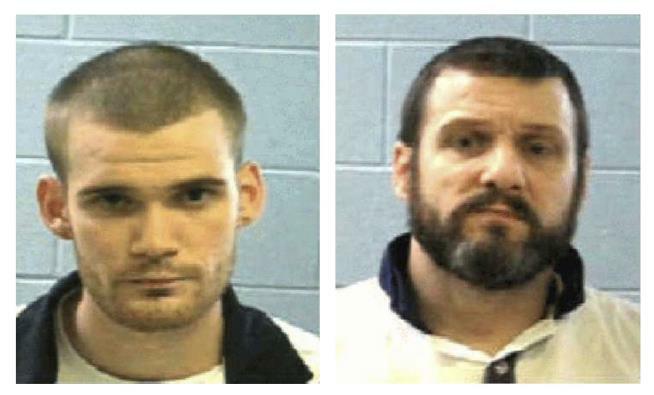 Inmates Ricky Dubose and Donnie Rowe, who authorities say escaped after killing two prison guards during a bus transport in Georgia. Both are being sought by law enforcement. Two convicts are on the loose after overpowering and killing a pair of correctional officers on a prisoner transport bus early Tuesday in Georgias. Ricky Dubose, 24, and Donnie Rowe, 43, were among the 30-some prisoners being transported from Baldwin County Prison, authorities say Dubose and Rowe overpowered the correctional officers around 5:45am, taking their weapons. One of the convicts then allegedly shot and killed both officers, identified as Christopher Monica and Curtis Billue. Authorities say Dubose and Rowe escaped the bus and carjacked a Honda Civic. A manhunt for Rowe and Dubose is underway, but authorities say they have “no idea” where the escapees are, noting the men have a few hours head start on police. Rowe and Dubose are believed to be armed with the officers’ guns, and citizens are warned not to approach them. Rowe was serving up to life in prison for armed robbery and aggravated assault. Dubose was serving up to 20 years in prison for armed robbery, aggravated assault, and theft. “An attack on any American law enforcement officer is an attack on every American law enforcement officer and the principles we all believe in,” the AP quotes Deputy Attorney General Rod Rosenstein as saying. Rosenstein says federal resources are involved in the hunt for the fugitives.